The Consulate General of Viet Nam in Perth, Australia has been established since 2012. 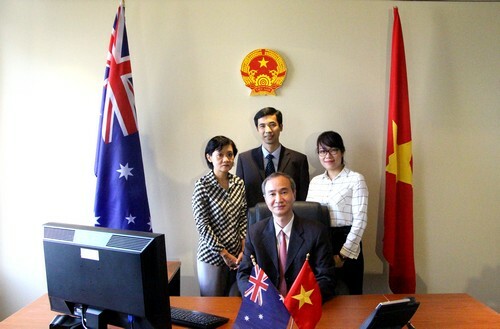 As an official mission of the Socialist Republic of Viet Nam, the Consulate General is responsible to promote the friendly and comprehensive cooperation between Viet Nam, including individual provinces of Viet Nam, with the state of Western Australia and the Northern Territory in accordance with the agreements between the leaders of the two countries. In performing our function as the official mission, we are in charge and have the authority to provide consular protection over the legitimate interests of the State, the citizens and entities of Viet Nam on the basis of the legal systems of both Viet Nam and Australia, in conformity with the international treaties/agreements of which Viet Nam and Australia are signatories, as well as in compliant with the universally recognized norms and principles of the international laws. We will do our best to promote the Consulate General as an important link between Viet Nam and Australia, and as a shared home for the Vietnamese people in Western Australia and the Northern Territory. We hope to have your support and cooperation as well as your feedback to better perform our duties. Wish you all the good health, happiness and successes in life.